There’s a terrific compilation out from TQ zine, called Tone Quanta. I am very pleased to have been able to contribute a track. If you’re new to that site you are in for a treat because it’s always full of good new-music information. 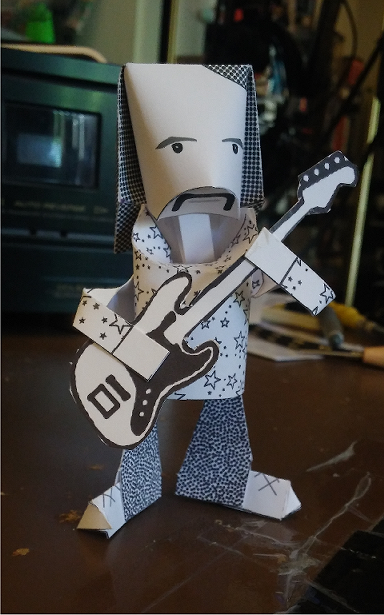 The current issue (#14) of TQ zine includes a very nice printed card-stock for this Holger Czukay papertoy, created by yours truly. If you’re unfamiliar with TQ please check it out. In addition to reviews and interviews concerning assorted underground/under-appreciated music each issue typically includes various goodies, such as free CDs and music downloads. It’s another birthday, and to celebrate I’ve prepared a pay-what-you-want compilation album of tracks from my first four albums (two of which have been released under the name Neurogami). I’ve been working on some visual art, with any additions to Small Guitar Pieces on hold for a bit. I'm ever so slowly working on a set of short, to-the-point e-books focused on technology for artists and other hackers. You can also visit the James Britt Amazon author page. My brother Gerry has written an outstanding collection of essays about his travels in Ireland. I'm an artist, writer, musician, and technologist living in Scottsdale, Arizona. I'm currently working on some E-books, focusing on technology for artists: Kinect Hacking for Artists and Open Sound Control for Artists. I like to see a strong Phoenix community of creative, inventive people, and helped start Refresh Phoenix (now sadly defunct), Ignite Phoenix, Refactor Phoenix, Barcamp Phoenix, AZ Hackers, and the Phoenix Ruby User Group. I run Neurogami, an art+technology multimedia development company. You can also find me at Google+, SoundCloud, Twitter, CD Baby, Ello, and probably a few other places. To reach me, see my About page.